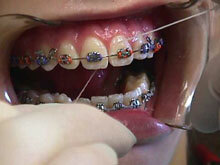 Teeth with braces need special care. 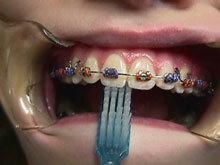 To make sure that your teeth look their best when your braces come off… YOU MUST KEEP THEM CLEAN! 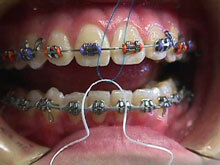 Brackets, wires and loose bands can trap food and plaque and make it very difficult to keep your teeth clean. Proper brushing and flossing is YOUR job throughout treatment. 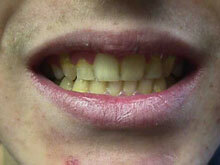 If you don’t keep your mouth clean, the teeth can mark, stain, and decay. 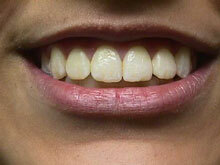 The gums can get red, swollen and will bleed easily. Unfortunately, these markings are often at times permanent and can only be removed by your dentist through filings or restorative work. Inspect your teeth and make sure they are spotless. If not… BRUSH AGAIN! Using a soft brush and fluoridated toothpaste, place the brush at an angle between the gums and the braces. Using a circular brushing motion will keep the gum area clean. Brush the outside and inside surfaces of your teeth in a back and forth motion. 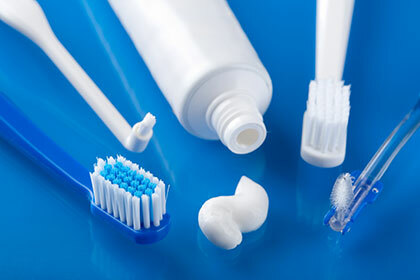 To make sure that you get the insides of your teeth clean, you may need to change the position of your toothbrush. 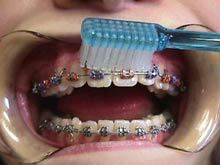 You will have to spend some extra time cleaning teeth with braces. Try to brush each tooth 10 times. Don't forget to brush your tongue and the chewing surfaces of your teeth. Because tooth brushing alone can not clean between your teeth, it is essential that you floss your teeth at least ONCE A DAY. This will prevent plaque from sticking to your teeth and causing cavities to form between your teeth. Flossing also exercises your gums and prevents them from getting red and swollen. 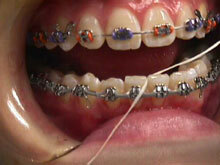 Flossing with braces on can be a bit tricky at first. Stick with it though, and in no time you will get the hang of it. Use any floss that you like (waxed floss seems to work the best). Start by flossing between the teeth until you hit the wire. This will make sure that the top part of the teeth stay clean. To get under the wire, use a floss threader (or a special floss that comes with a hard end for easier threading under the wire). This will enable you to get the floss into the gum area, where good cleaning is very important. Floss around each tooth. Pay particular attention to the area of the tooth under the gum. This is where plaque, germs and food love to hide. Don't press too hard as to cut the gum tissue. You must continue to visit your family dentist at regular six month intervals for proper cleaning and exams throughout your orthodontic treatment. Brushing and flossing… along with making your appointments, watching what you eat, and wearing your appliances… all contribute to a successful treatment. Orthodontics is a team sport. While your orthodontist is responsible for straightening your teeth, YOU are responsible for keeping them clean and healthy throughout treatment. If you do not do your job, as straight as your teeth may be at the end of brace therapy, the teeth will not look their best. Work hard and follow our instructions and you will have a beautiful smile that will last a lifetime.